One of our goals for every wedding that we photograph is to blend so seamlessly into the background that the couple, their families and their guests forget that we are even there. The shots we are looking for — the ones we value the most — are the ones that show the raw, unfiltered emotions that people experience on such an important day. We cannot get the pride on a father’s face as he delivers his little girl to her future husband, the tears in the groom’s eyes as he reads a letter from his bride-to-be or the goofy exuberance of the guests letting loose on the dance floor if they are aware of our presence. This approach to wedding photography obviously demands a lot of concentration and focus from us, because one never knows when a beautiful moment might come and go. Fortunately, we have the built-in advantage of being a husband-and-wife team. This allows us to get all the standard “safe” photos that we need to deliver to the client while also remaining alert to all the little stories playing out at the margins. One of us acts as the first shooter, focusing on the main event, and the other as the second shooter, looking for unusual angles or more emotional scenes. This particular image was taken at a wedding in Lake Lure, North Carolina. It is one of the photos we are most proud of having taken in our careers. Not just because it gives us pride as photographers to have captured such unfettered emotion, but also because we were able to give the bride a permanent reminder of what was a very special moment for her. Her husband is a former U.S. soldier who lost his legs while serving in Afghanistan. As a result, theirs was a wedding day full of emotional moments, from the bond that the groom shared with his former comrades-in-arms to his determination to stand at the altar on his prosthetic legs. 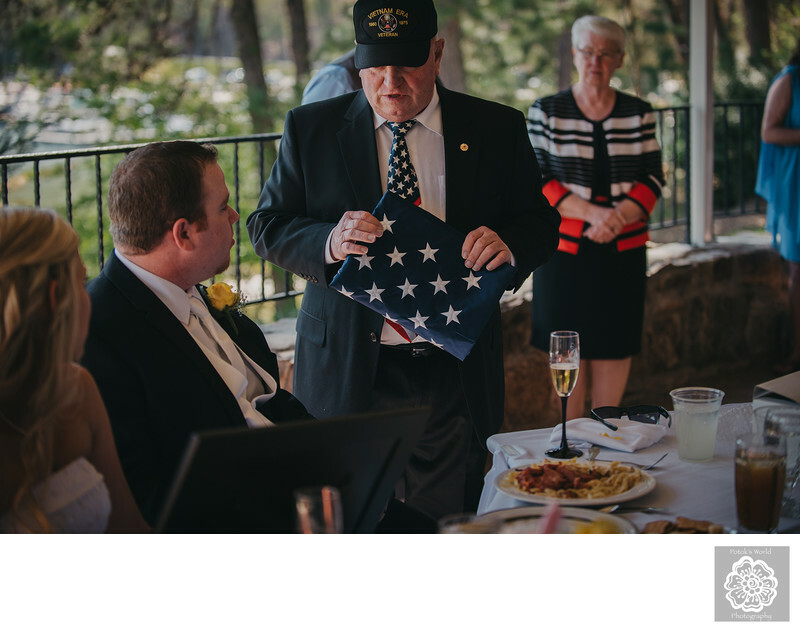 Arguably the most moving moment of the day, however, came during the reception, when an elderly veteran presented two very special gifts to the groom. The first was a painting of an eagle in front of the American flag done by Gil Cornett, a former member of the U.S. Air Force, who gave it as a gift to more than 7000 of his fellow veterans in his lifetime. The second was laden with even more significance for the groom. It was an American flag that, like the groom, had been damaged in the course of its lifetime representing its country. The retired soldier explained that even though the flag and its recipient had been injured, they still mattered in the hearts of those whom they had served. By the end of the presentation, there was not a dry eye in the house – not even ours! Obviously, though, the gifts had the biggest impact on the bride and groom. The bride, in particular, was completely overwhelmed. She knew how much her husband had sacrificed as a soldier and how much he had suffered in the time since his return to the U.S. As the elderly veteran was explaining the gifts, tears began to stream down her face and she brought her hand to her mouth, wordlessly and perfectly conveying how touched she was by the gesture. As this scene was unfolding, my husband Pete was standing to the side of the table the bride and groom were sitting at and capturing the older gentleman handing the gifts to the groom. He took those shots with a wider-angle lens to get everything in the frame and to make sure that we documented this moment properly. Having him do this allowed me to stand directly facing the bride so that I could better capture her unguarded reaction as it unfolded. Location: Rumbling Bald Resort on Lake Lure, 112 Mountain Blvd, Lake Lure, NC 28746.